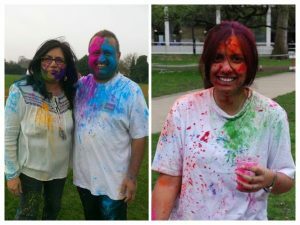 Around the world people have been celebrating the Hindu festival of Holi this week. 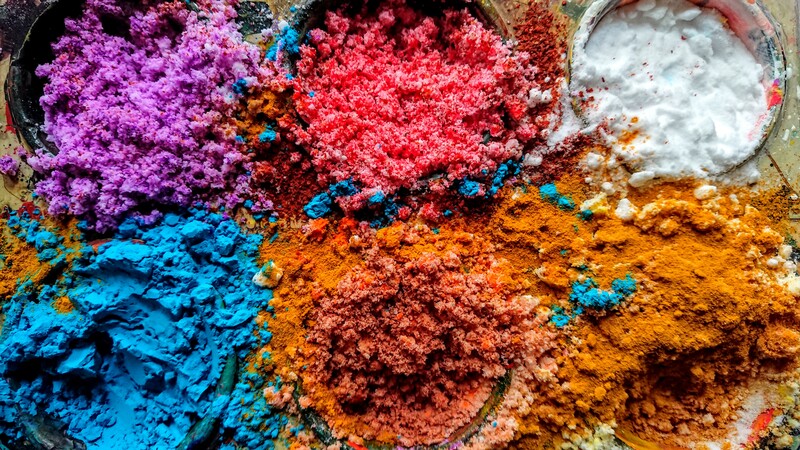 Holi marks the beginning of spring and huge parties and processions take place with everyone throwing coloured powders and coloured water at each other in an epic paint fight – hence the popular name, a festival of colours. Everyone wears white clothes so that the colours show up more dramatically and nobody is off limits – teachers… elders… everyone is fair game! The story of Holi is based on the legend of the demon king Hiranyakashyap, who had been granted five special powers of immortality. Firstly, he could not be killed by a human or an animal. Secondly, he could not be killed in the day or at night. Thirdly, he could not be killed either indoors or outdoors. Fourthly, he could not be killed on land, in water or in air. And finally, he could not be killed by any weapon, either projectile or handheld. Due to his immortality, arrogance and greed, he wanted everybody in his kingdom to only worship him, instead of the gods. However his own son, Prahlad, was a faithful devotee of Lord Vishnu. This greatly angered King Hiranyakashyap, so much so that he sentenced his son to death. He tried many ways to kill his son but none of them worked. He had him beaten by soldiers and drowned in a well, flung him in a pit full of poisonous snakes, had him trampled by elephants – but each and every time, Prahlad prayed to Lord Vishnu who saved him. Frustrated and angry, he turned to his sister Holika for help. She also had been granted special powers by which she could enter fire without any damage to herself. She wickedly agreed to trick Prahlad into a blazing bonfire so that he would die. However, she had forgotten the condition of her powers; that it only works if she is alone. Therefore, when the fire raged, she paid the ultimate price for her wickedness and Prahlad was once again saved by the grace of Lord Vishnu. Vishnu then came to Earth in the form of Narasimha – half human and half lion (neither a human or an animal. He came to King Hiranyakashyap at dusk (neither day or night) and met him at his doorstep (neither indoors or outdoors). He placed him on his lap (which is neither on land, in water or in air) and tore the king apart with his lion claws (neither a projectile or handheld weapon). The death of Hiranyakashyap signifies the victory of good over evil and the triumph of true devotion. The celebratory bonfires lit at Holi are a symbol of the fire that burned Holika.